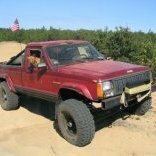 I have a 1987 XJ Wagoneer AW4 auto and a NP242 transfer case for sale. They were pulled and stored in my garage. It had 104k on it and it worked good. Came from a well maintained jeep. Located in north west CT, I won’t ship but I will travel a couple hours to meet you. nice! that's a 21 spline 242 for anyone with a 2.5L that wants an awd option. Still learning so bare with me. Will that 242 button up to my 86 2.5L and AX5, or would I have move up to an Ax15 because of the spline count difference? AX-5s are 21 spline. AX-15s are 23 spline.